At least 29 migrants die of hypothermia after Italian coastguard rescue. At least 29 migrants have died of hypothermia on board Italian coastguard vessels after being picked up from an inflatable boat adrift near Libya, the chief health official on the island of Lampedusa has said. Two patrol boats picked up 105 migrants late on Sunday from the boat drifting in extreme sea conditions, with waves as high as eight metres (26 feet) and temperatures just a few degrees above zero, the coastguard said in a statement. The migrants then spent about 18 hours on the decks of the small patrol boats taking them to Lampedusa, buffeted by high winds and spray. At least 29 died en route, Lampedusa’s mayor, Giusi Nicolini, said. “Mare Nostrum was an emergency solution to a humanitarian crisis, so closing it was a huge and intolerable step backward,” Nicolini said. Human rights groups repeatedly warned that ending the mission would endanger lives. Mare Nostrum was abandoned partly because of public concern about the €114m (£85m) cost of the mission in its first year. The EU now runs a border control operation, called Triton, with fewer ships and a much smaller area of operation. 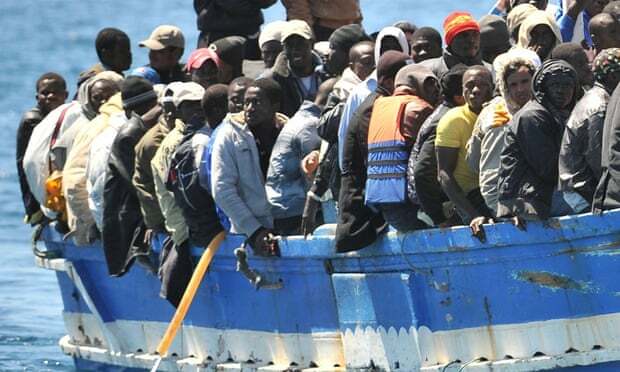 The UN refugee agency says 160,000 seaborne migrants arrived in Italy by November 2014 and a further 40,000 in Greece. Thousands have died attempting the journey. Posted on 10th February 2015 by newsafrica. This entry was posted in Africa, European Union, Human Trafficking, Italy. Bookmark the permalink.